This post may contain affiliate links. That means if you click on my link and buy something, I will earn a small commission from the advertiser at no additional cost to you. Here's the newest project we are tackling at my Mom's. Previously, she had her office in the master bedroom and was sleeping in the extra bedroom. I convinced her to make the extra bedroom into her office. And move herself back into the master bedroom. 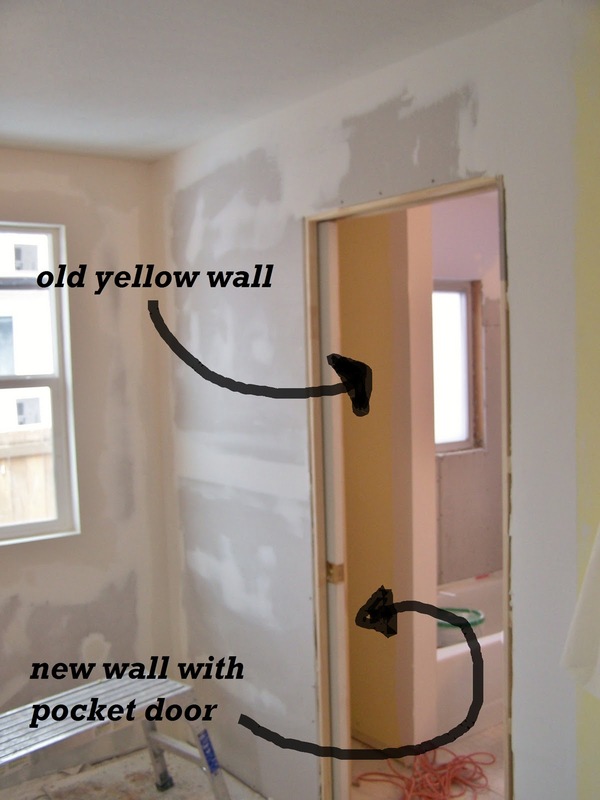 As we were in the planning stage she didn't want to cut into the wall to the bathroom. So we went another direction. But thankfully at the last minute Nana decided she wanted to cut through that wall!!! I was secretly wanting her to all along!!! So I forgot to take before pictures, but here are some just after we started. She had laminate for the tub surround. So we took that down. We are going to put up cement board and tile!! Next out came the extremely small linen closet. (Seriously why they even bothered making it is beyond me. The opening was like 10". 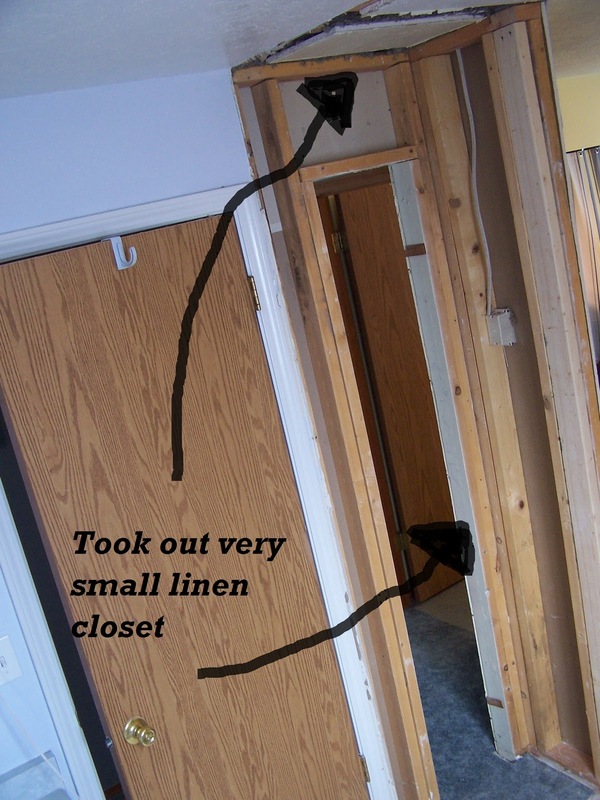 Here is the front view of where the linen closet was. Next we cut a huge hole in the wall the bathtub was on. Just back to the tub. Nana loves light so we added two windows to her bedroom. Next we built a new wall about two feet in front of the wall we took down. The photo below is just after we took the walls down. Adding those two feet to her bathroom made a huge difference in the size and feel of the bathroom. Here is the new wall and pocket door we had put in. Next we painted the bedroom. Nana was really afraid to go with the grey blue color I picked. She thought it would feel cold. until she got to the paint counter and then she just went with the color I picked. Once it started going up on the walls Nana started to get giddy. She was in love with the color. She was so glad she went with the grey blue!!!!! It looks blue in some lights and grey in other lights. Nana says it's just like the sky! 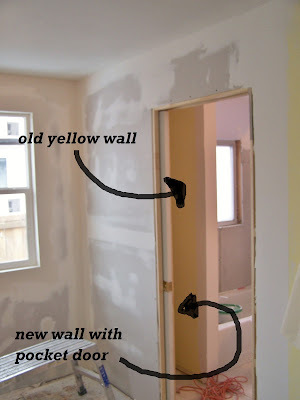 So we are concentrating on the bedroom first and then we will tackle the bathroom. Here is a sketch of the direction we are going for her room. Soon I'll post the light fixture redo and nightstand we reworked. I love the way this new space is coming together! It already looks like a different space and it's not done yet! Looking forward to seeing the finished product! Love, love, love the color! It is a lot like the blue accent wall in my old house. I'm sure it will be awesome! Ronda, you are amazing. The color is great. I love the sketch of her room. I am going to guess that the new space in the bathroom is for a linen closet. I look forward to seeing the reveal. I Love you Sis and I love my rooms. Laundry Room Reveal or How to Pack Lots of Function into Your Laundry Room for Less!